Chocolate is one of the most glorious substances on this planet. The bean is native to parts of Central and South America and have been harvested to make natural skin moisturizers in places like Mesoamerica and the Caribbean for centuries. Cocoa Butter is a vegetable fat extracted from cocoa beans. It’s a popular skin loving ingredient known for its moisturizing properties. Often used in skin lotions, lip glosses, lip balms and other beauty ointments. Cocoa butter is great for naturally healing dry, sensitive skin. It has a mild smell, similar to dark chocolate. The saturated fats make it easy for skin absorption. 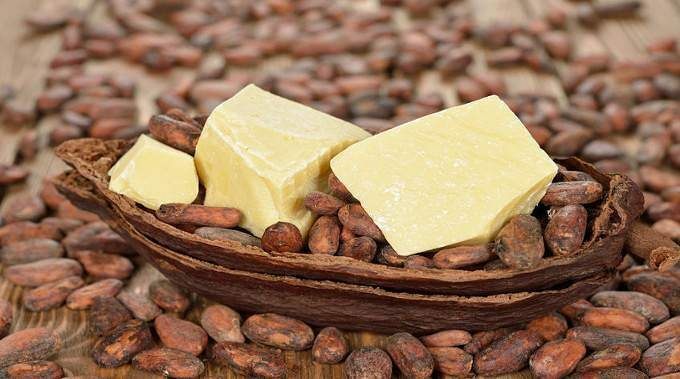 One of the most important qualities of cocoa butter is its high stability as compared to other fats. This unique aspect gives it a very impressive shelf life of 2-5 years, which is even further improved by the antioxidants found in cocoa butter, thereby reducing the chances of the oil becoming rancid. We owe our knowledge of cocoa to the Aztecs. They created the original form of hot chocolate, which was a fiery, chocolate drink. The cacao tree is native to tropical America and is known as the Theobroma cacao – ‘the food of the gods’. Trying to avoid this ingredient? Click here to see formulations that dont include it. Looking for a base with this ingredient? Click here to see formulations that include it.